Marvel at the talent, but also the willpower. 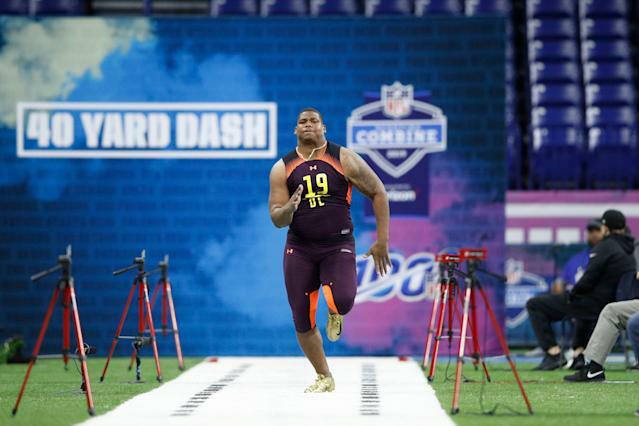 Alabama defensive lineman Quinnen Williams ran a personal best 40 at the NFL scouting combine. He ran a 4.87, his best mark to that point, and one-upped it with a time of 4.83. It’s the fastest time by a player weighing more than 300 pounds since 2012 and the fourth fastest since 2003. The snack of choice for the 6-foot-3, 303-pound prospect? Four. Oreo. Cookies. Not rows — the order of measure the brand should use as its serving size to keep it realistic with us — but single cookies. It’s not difficult to blast through half a row without realizing it, so kudos to Williams for the willpower because there’s no way only four fit in his hand for a meal on-the-go. He professed his love for the snack during a combine news conference, adding he eats Oreos “almost every day.” He gave them up to train for the combine, per The Athletic, so in his first reckoning with the addictive cookie he kept himself to four Double-Stuf Oreos. Nope. Can’t get over it. Oreo hasn’t chimed in on Twitter, but did have this heartbreaking note over the weekend on serving sizes and at least Williams broke that mark. Sign him up, Oreo. He’ll even live by your recommended serving size. Or at least close to it.